The 2014 Ford Fiesta and Focus ST are the hottest hatches on the planet and they just got hotter. Ford has announced they will offer a Mountune upgrade that will increase performance even more and they can be installed in 90 minutes or less. That sounds like a great deal for performance enthusiasts. And the performance numbers are impressive for this new upgrade. The packages are developed by race engine and road-car performance specialist Mountune and are offered as a factory install and covered by Ford warranty. The performance upgrade will only be available for the lucky folks in European markets and not here in the U.S. That’s too bad because this upgrade will boost performance and make the two hot hatches even better. Ford says the Mountune Focus ST will get a power boost output from the Focus ST’s 2.0-litre EcoBoost engine to 275 PS, 10 PS more than from a Porsche Boxster. And it will sprint from 0-100 km/h (0-62 mph) in less than 6 seconds. That's impressive for the Mountune upgrade. The Mountune Fiesta ST will get a power increase to 215 PS, enabling acceleration of 0-100 km/h (0-62 mph) in 6.7 seconds, compared with 6.9 seconds on the factory model. That’s faster than a Mercedes-Benz SLK 200 AMG Sport 7G-Tronic Plus. Ford is stepping up and giving the competition a good run. “Ford’s ST models already deliver blistering performance – for these Mountune upgrades we have squeezed out every last drop of fun and served it on a plate to the fans that are as passionate about performance as we are,” said Tyrone Johnson, Ford Team RS engineering manager. In-gear acceleration is also improved and the numbers don’t lie. Ford claims the Mountune upgrades boost Focus ST torque to 400 Nm and improves 50-100 km/h (31-62 mph) acceleration in fourth gear by 0.8 seconds to 4.9 seconds. Peak Fiesta ST torque is boosted to 320 Nm and improves 50-100 km/h (31-62 mph) acceleration in fourth gear by 0.7 seconds to 5.7 seconds. The competition should be scared because each model costs less than standard rivals Volkswagen Golf GTi, and the Peugeot 208 GTi and Renaultsport Clio 200. The Focus ST Mountune upgrade comes in silver or black and includes a cast alloy inlet duct, high-flow air filter element, larger alloy intercooler and unique calibration. The Fiesta ST version has a re-modelled air box base with secondary inlet duct, a high-flow filter element and unique calibration. 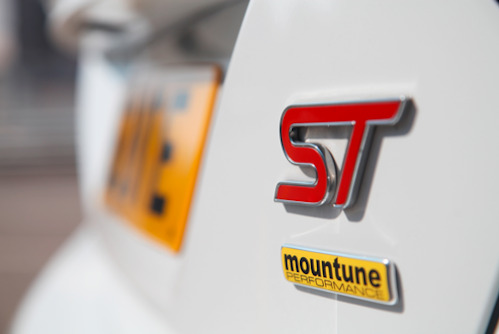 The Mountune upgrade will be available in select European markets from September 2013 costing from 1,225 pounds for the 2014 Focus ST and 599 for 2014 Fiesta ST models. The Europeans get to have all the fun.